Attin-Johnson was preaching to the converted. 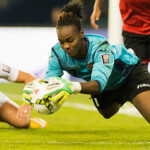 Three weeks ago, there was concern and criticism as the Trinidad and Tobago Football Association (TTFA) announced record prices for the women’s decisive FIFA 2015 World Cup Play Off fixture against Ecuador, which kicks off at 6 pm today at the Hasely Crawford Stadium in Port of Spain. 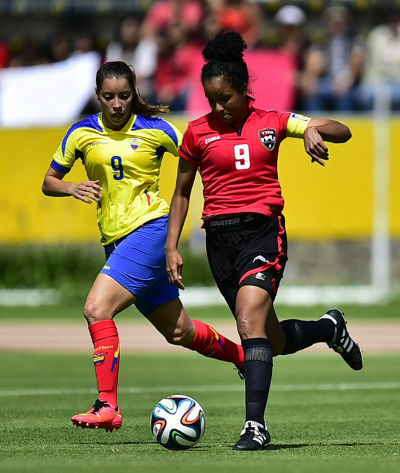 Photo: Trinidad and Tobago midfielder and captain Maylee Attin-Johnson (right) advances with the ball under pressure Ecuador star Gianina Lattanzio during the first leg of the FIFA Play Off in Quito. In the end, patrons who procrastinated were left in a mad scramble for tickets this morning after much of the 22,000 available seats were gobbled up by last weekend. The national women footballers, abandoned and neglected up to two months ago, now carry the enthusiasm of the nation on their shoulders. The story of the current squad really began in 2012 when the structure of the 2015 World Cup qualifying series was announced and CONCACAF received an additional half-spot. 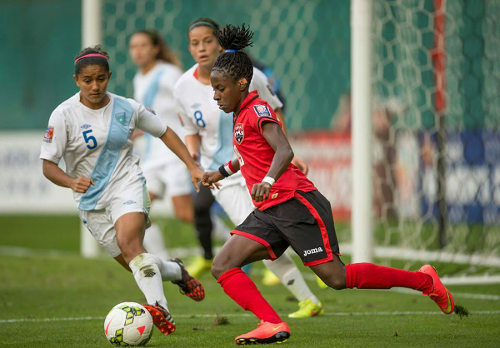 With Canada already qualified as the host nation and the United States and Mexico considered certainties, a favourable draw would pit Trinidad and Tobago and Costa Rica in a fight for the final qualifying spot. At worse, the two island republic, the Caribbean’s most southern nation which is a little more than a stone’s throw from the Venezuelan border, would face the FIFA Play Offs. 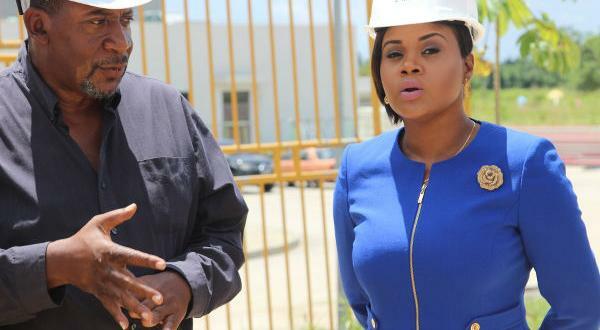 The problem with that dream was their football body, whose special advisor and FIFA vice-president Jack Warner had just gone done in flames, was virtually bankrupt and the women’s team was a minor priority at best. There was no money; and sometimes the women had to borrow equipment and pool money to buy water and refreshments for training. Between 2012 and June 2014, the women did not play a single international game and FIFA cancelled their ranking. Even when the football body did try to help, the results were sometimes farcical. The TTFA signed an American coach Randy Waldrum who agreed to work for free but then could not raise the money to get visas for the players to join him in Dallas. Waldrum started work with about a dozen players in July while TTFA general secretary Sheldon Phillips tried to prise the remaining funds from the government. Photo: Trinidad and Tobago head coach Randy Waldrum (right) speaks to his players during a practice session in the United States. Long-suffering head coach Marlon Charles, who worked with the women when there were no resources, was sacked by press release, re-hired and then sacked again before the team left for a pre-CONCACAF tournament camp in October. Charles, incidentally, did not receive a ticket from the TTFA for this evening’s historic fixture. Like it or not, the tweet changed everything. “Our preparation was abysmal,” Attin-Johnson said then. 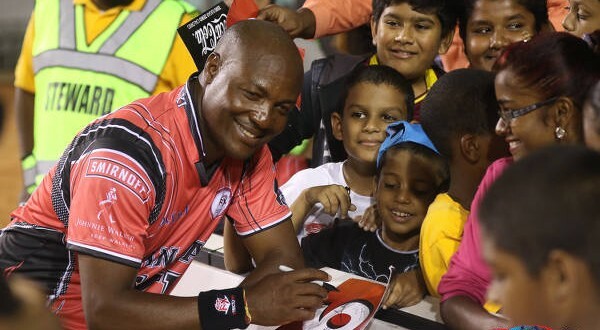 “It was what we didn’t expect after being champions of the Caribbean. But that is water under the bridge now. 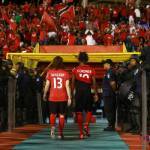 The Trinidad and Tobago team, in its first act of rebellion, ditched its sobriquet as the “Soca Princesses” and demanded to be called the “Women Soca Warriors” instead. And, with the eyes of the hemisphere on them, they defied FIFA’s number one ranked team for long periods before losing 1-0 in their CONCACAF opener. 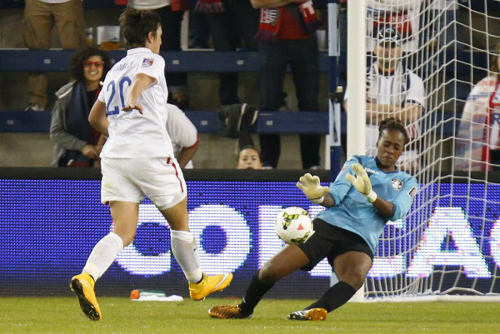 Photo: Trinidad and Tobago goalkeeper Kimika Forbes (right) saves from United States record goal scorer Abby Wambach in Women’s World Cup qualifying action in Kansas City. 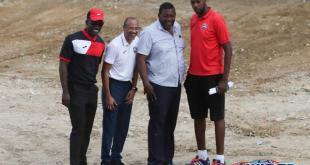 The Ministry of the Sport and the TTFA raced to keep up. Before the CONCACAF competition was over, each player was promised just under US$8,000 from the Government. When the Warriors prepared to board their flight for Ecuador, via Mexico, general secretary Sheldon Phillips showed up at the airport with around US$3,000 for each player in brown envelopes. 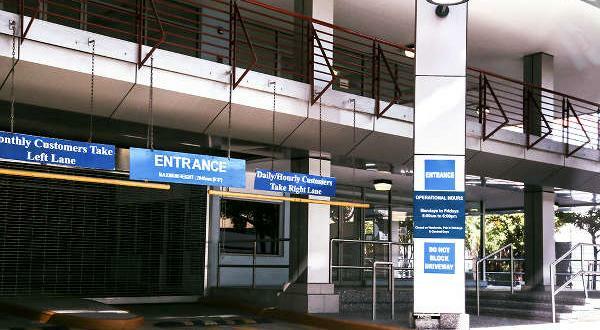 And, for the past week, the Warriors have prepared for their decisive fixture while camped at the five-star Hyatt Regency Hotel in Port of Spain. A vital part of the Warriors’ entourage since the second game of their CONCACAF adventure is sport psychologist Dr Margaret Ottley who is teaching them how to restructure their thoughts, control their adrenalin and collectively pool their energies for each other. Ottley, a Trinidadian full professor at West Chester University in Pennsylvania and ex-staff member of the US 2008 Olympics track and field team, wants the women to dance with the crowd today. “The audience can be like a lion or a snake that you see as a threat or someone who has come to give you love,” Ottley told Wired868. “I study African rhythms and aesthetics; everything is about rhythm. The earth is a big drum. 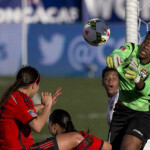 Photo: Trinidad and Tobago players (from left) Ahkeela Mollon, Maylee Attin-Johnson and Kennya Cordner try to close down Costa Rica playmaker and captain Shirley Cruz during the 2014 Women’s CONCACAF Championship semifinal. The Warriors play an honest, straightforward game built on solid collective defence and the explosive pace and individual trickery of Ahkeela Mollon, who plays professionally in Sweden, and women’s player of the year, Kennya “YaYa” Cordner, on the break. Attin-Johnson, a classy, ball-playing midfielder, solid defender Arin King and defiant goalkeeper Kimika Forbes will try to build a platform for Mollon and Cordner to showcase their talents against a quick, intelligent Ecuador team. Waldrum said the Warriors will play an attacking game. “We know we need a win so we will go after the game,” he said. “I don’t think we have the players who have the mentality to sit back and defend and I don’t either. I like attacking football. But this is where it gets tricky. Offensively, the Warriors have struggled since they left the Caribbean round. In 600 minutes of football minus stoppage time against Ecuador, Mexico, Costa Rica, Guatemala, Haiti and the United States, Trinidad and Tobago managed 16 shots on target at an average of two per game. The team has so struggled for rhythm in the opposing half that striker Mariah Shade, a shrewd penalty box operator, has closer resembled in a defender in the last two months. Waldrum had requested two international practice games before this evening’s fixture but the Warriors did not get any. He did suggest, though, the improved physical condition of his midfield should translate to more control over the game and, hopefully, better opportunities to win the match. When the battle begins, though, it is hard to shake the notion that the likes of Cordner, Mollon and Attin-Johnson will somehow find a way to upset the odds again. Or that a previously unheralded player like Lauryn Hutchinson or Forbes will emerge to steal the show. 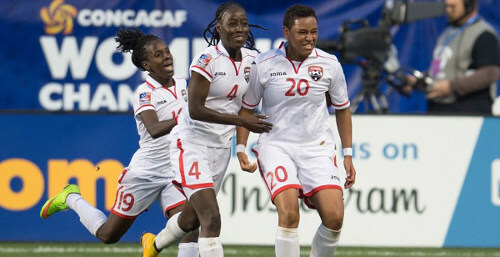 Photo: Trinidad and Tobago players Lauryn Hutchinson (right), Rhea Belgrave (centre) and Kennya Cordner celebrate against Costa Rica during the CONCACAF Championships. “I think we are excited, confident; a little bit of butterflies,” said Attin-Johnson, “but we know that once we touch that ball it is game on. 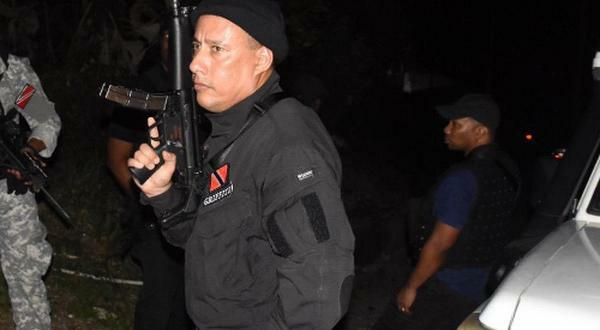 Trinidad and Tobago is holding its collective breath. I don’t think a lot of people appreciate the massive achievement of our woman’s team against the backdrop of an inept TTFA. The no food in the US was merely one of the signs and they were able to overcome that and hold the mighty US and then went on to do themselves proud. Its time to start to build . Better TTFA processes and management will result in better perfomances of out Teams. These tickets have gone to the bandwagonists who will not stick around through difficult times. The question is how to you drum up consistent support for a national team that is continually short thrifted by the TTFA? If it is oveffilled,like 1989,protest registered,there goes the game.Dirty tricks to the max. 🙂 Who else going? Anyone has extra tickets….? Anyone change their mind by any chance? 🙂 A girl can dream…. Will you be there Lasana? Holding our collective breaths and wishing them well! Whether the stadium will be filled remains to be seen…scalpers have plenty tickets still. And the only person who should apologise is the one who claimed Lasana’s story was a diabolical lie. I wish them luck because they will need some of that as well. Can’t help but wonder how much better off we would have been if they had received the kind of support they deserved as Caribbean champions. It was not really a mad scramble, more like torture waiting in the sun, some people trying to be ordered and others just not caring and a couple people got well-squashed because they were in front…(but at least they got tickets! ), with no official word until they had sold a couple of tickets sometime – (literally! ), then they finally found a loud speaker to say the tickets were sold out! I really hope the stadium is packed… scalpers still have a lot of tickets.